Hubby and I were chatting the other day that we see a need for more flasks in our life. He mentioned skiing, but I thought of weddings where they don't have my Southern Comfort. Both were deemed occasions requiring a flask. So I thought back to a girls' weekend years ago when I saw some adorable Anne Taintor flasks at a great vintage store, and for whatever reason, did not purchase one right then. 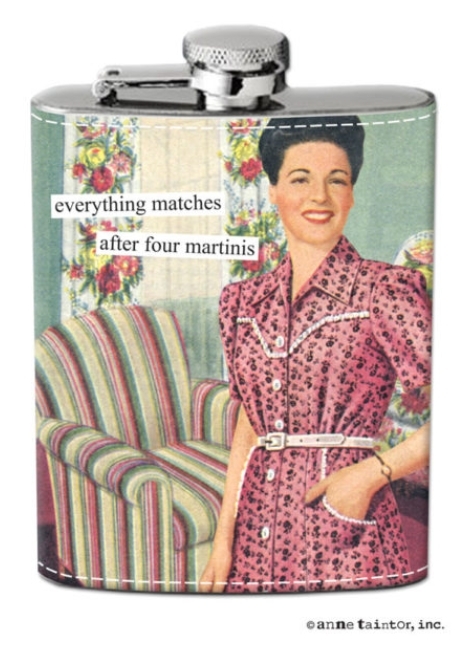 I've actually thought back to that a few times - one of my regrets in life, not getting that flask when I had the chance. Anyway, a flask has finally made it to my holiday wish list. She's designed several great ones to choose from; I'd actually recommend looking over her whole site for some giggles. 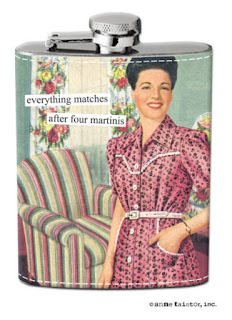 On looking through them today, I'd definitely choose 'everything matches after four martinis,' but feel free to send me a different one if you really think it would be better for me. As I said, my flask will usually contain Southern Comfort. While I've gotten bourbon or whiskey plenty of times at a wedding or other occasion for an open bar, the SoCo is always my favorite. What would your flask contain? And what the best reason to carry it?